Put a pan of warm water into the oven, on the bottom rack, to keep the moistness in the salmon. 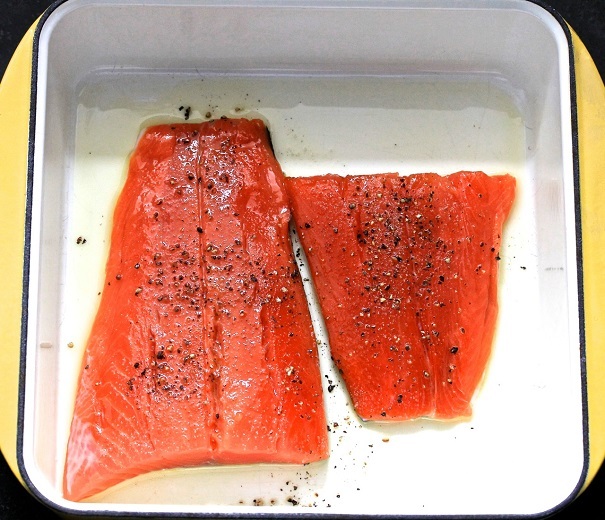 Brush down the baking pan with olive oil, place salmon in pan and brush salmon with oil as well. Salt and pepper to taste. 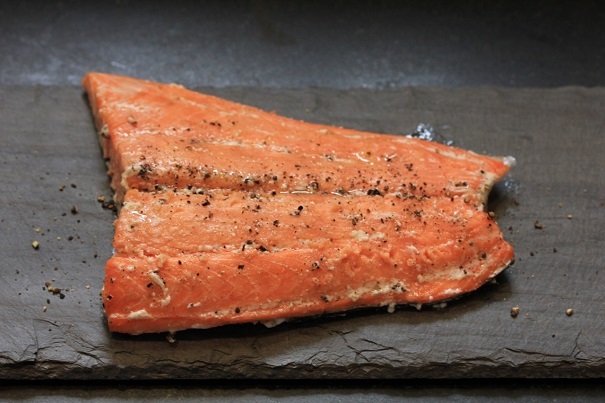 Allow 1 – 1 ½ hours for salmon to cook through slowly. The salmon will be done with it is slightly firm to the touch and the fish juices are running out of the fish. Serve topped with lemon relish. In a small mixing bowl, combine shallot, vinegar, squeeze of lemon and salt and pepper. Trim pulp from lemon skin and mince skin finely. Add lemon pieces, parsley and olive oil to shallots and adjust seasoning. Use as an accompaniment to the salmon. Serve.